ALEXANDRA Coming from an art and design background, I knew Ceci New York was the perfect fit. Our guests are still talking about our wedding invitation! 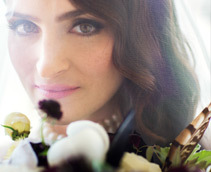 What It's Like to Be a Ceci New York Bride: The Ceci team is simply amazing. They are truly design professionals and were able to make my vision a reality. Designing our invitation with Ceci was one of my favorite parts of the wedding planning process!